As this post goes live, I am sitting (in the very, very early morning) in a waiting room of a surgery center about to send my sweet two year old little boy back for minor surgery. As my husband put it, with everything Emmett has been through (meaning the dangerous form of epilepsy he batted as a baby and the weeks he spent in hospitals as a result), this is “a walk in the park,” but even as I type this post two days beforehand, I’m freaking out. He’s getting tubes placed in his ears in hopes of preventing more frequent ear infections and most likely also getting his adenoids removed in hopes of curing his sleep apnea and snoring (something that I’ve learned isn’t normal or healthy for a toddler). In an effort to not think about this moment, I spent a lot of late nights this week lying in bed wasting time on the internet. Lucky for me, I did find some cool links. So here I am, sharing with you below, via this month’s Links I Love post. I love love love this piece on NPR called Turning the Tables: The 150 Greatest Albums by Women (As Chosen By You). I also 100% agree with Blue by Joni Mitchell coming in at #1. In case you missed my post last week about Target’s new travel inspired home collection, it’s now officially for sale. I want all of this. I’m one of those terrible parents who gives my kids screen time (especially when I’m really busy with work and don’t have childcare), but I am careful about what I let them watch. This piece on 10 toddler TV shoes that won’t make your skin crawl is a good one for my fellow bad moms and dads who allow television for their little ones. 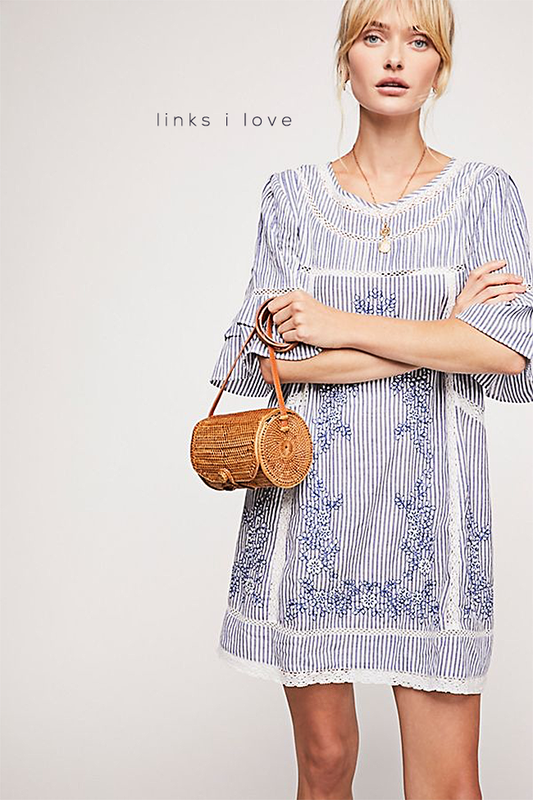 I want The Sunny Day Dress (seen in image above) from Free People to be my summer 2018 uniform. This American Girl Resale Store empowers women with Autism. So cool. Still laughing over this awesome dog that followed a Google Street View Car in Japan and “ruined” every photo. I can’t get this super chic cactus necklace out of my head. Farewell beloved veggie puffs. These “healthy” snacks are actually pretty bad for you. I’m normally such a boring neutral no pattern person when it comes to bedsheets but these leaf print sheets are seriously everything. This photographer wants to put a museum in your pocket. Awesome. I’m mildly obsessed with these wide legged cropped pants from Madewell, and not just because they’re called the Emmett Pants. If you’re reading this in the early morning, please shout out a little prayer to the universe that Emmett gets through this okay. (Which he will, but worrying is what mamas do best.) Then go have yourself a wonderful Friday and even better weekend. See you Monday, friends.